On the afternoon of March 22, 2016, the new Liberal government introduced its first federal budget (the budget). For those of you who subscribe to the theory “too long… didn’t read,” below is an executive summary of the tax measures that may be of interest, followed by some analysis and commentary. No changes to the current stock option taxation regime are in the budget materials. Following the release of the budget, the government announced they will not be proceeding with any changes to the current taxation regime involving stock options. The changes to the taxation of Canadian-controlled private corporations (CCPCs) are rather modest and include measures to prevent the multiplication of small business deductions through the use of certain common structures. No changes to the eligibility for the small business deduction for certain corporations (such as professional corporations) are proposed. Currently, the federal tax rate for CCPCs that are eligible for the small business deduction is 10.5 per cent. Gradual reductions to such rates were announced by the previous government and were scheduled to take effect from 2017 to 2019. The 2016 budget materials contain proposals to eliminate such gradual reductions and keep the current rate at 10.5 per cent with no changes to the existing dividend tax credit regime for non-eligible dividends. The 2015 federal budget announced a consultation on whether certain income from property could be considered active income. The budget materials announced that the consultation is now complete and the government is not proposing any modification to the existing rules at this time. There is no increase in capital gains inclusion rates in this budget. Some people, including our firm, speculated the government might be tempted to increase such inclusion rates from the current 50 per cent to something higher. Certain additional tax consequential amendments will be made to the Income Tax Act (the Act) in order to accommodate the increased personal tax rate previously announced. In other words, the government is committed to higher tax rates for individuals who have taxable income in excess of $200,000. This is highly disappointing. The current eligible capital property (ECP) regime is to be repealed and replaced with the existing capital cost allowance (CCA) system effective January 1, 2017. The budget materials contain detailed proposals on how the ECP regime will be eliminated and replaced. Measures to exempt capital gains from taxation where there is a direct donation of private corporation shares or Canadian real estate to a charity— first introduced in the 2015 federal budget—will not be proceeding. This is disappointing. The government affirmed its intention to proceed with subsection 55(2) amendments that were announced in the 2015 budget. However, there are no specific additional technical amendments proposed by the budget material. Certain life insurance strategies involving the preservation of the capital dividend account (CDA) through careful ownership of life insurance policies will be tightened so as to prevent such planning. Certain strategies involving the non-arm’s length transfer of life insurance policies to corporations that then enable the shareholder to extract surplus from the corporation on a tax-free basis have been shut down. Legislative proposals to introduce country-by-country reporting standards for large multinational enterprises will be introduced. The budget announced/confirmed that Canada is participating in international work to develop a multilateral instrument to streamline the implementation of treaty-related recommendations of the OECD as a result of its BEPS recommendations. The Family Tax Cut, or the so-called family income splitting tax credit, currently existing in section 119.1 of the Act will be repealed effective immediately. Teachers will be happy – there is now a teacher and early educator school supply tax credit. It will enable an eligible educator to claim a 15 per cent refundable tax credit on a maximum of $1,000 of eligible supplies. The education and textbook personal tax credits will be eliminated for the 2017 taxation year and forward. In addition, the existing children’s fitness and arts personal tax credits will be phased out and eliminated for the 2017 taxation year and forward. There are numerous targeted changes to the Canada Child Benefit program. The Liberal Party made significant waves in the tax community when it campaigned on a promise to revise the current taxation regime involving stock options. Overly simplified, the current regime involves certain eligible employees effectively paying tax on only one half of their realized economic benefit when such options are exercised. The election rhetoric loudly trumpeted that such result was unfair and the Liberals would change this result. Once elected, the new Finance Minister briefly discussed that any changes would be grandfathered and current stock options would not be affected. Many people, including our firm, fully expected to see legislative proposals to implement the Liberals’ election promise. However, no such amendments exist in the budget documents. After the release of the budget documents, the government announced that no changes to the current taxation regime involving stock options would be made. Again, because of the Liberal election platform which suggested that CCPCs were often used by high income earners (such as professionals) as inappropriate tax vehicles, many tax advisors were concerned that the Liberals would follow through on their rhetoric. Thankfully, the budget materials do not contain any radical changes to the taxation of CCPCs. One change, however, is that the scheduled reduction for CCPCs that are eligible for the lower tax rate will not proceed. Instead, the small business tax rate will stay at its current rate of 10.5 per cent. The rate was scheduled to be reduced to 9 per cent by 2019. Also, as a consequence, the scheduled changes to the gross-up factor and dividend tax credit rate applicable to non-eligible dividends will not proceed and they will remain at the current level: 17 per cent gross-up and the credit at 21/29 of the gross-up amount. Overall, these are modest changes and not surprising. the SPI limit of a deemed member of a partnership will initially be nil (as it does not receive any allocations of income from the partnership). However, an actual member of the partnership who does not deal at arm’s length with a deemed member of the partnership will be entitled to notionally assign to the deemed member all of or a portion of the actual member’s SPI limit in respect of a fiscal period of the partnership that ends in the deemed member’s taxation year (and where the actual partner is an individual, the assignable SPI limit of all members of the partnership will be determined as if they were corporations). This measure will apply to taxation years that begin on or after Budget Day. However, an actual member of a partnership will be entitled to notionally assign all or a portion of the member’s SPI limit in respect of their taxation year that begins before and ends on or after Budget Day. Accordingly, this type of planning will effectively be shut down. Affected taxpayers—and there are many—will need to re-think their planning in the days to come. The amount determined by the Minister to be reasonable in the circumstances. Similar to the partnership anti-avoidance rule, an exception is provided where all or substantially all of the CCPC’s income is earned from providing services or property to arm’s length persons other than the private corporation. These changes will apply to taxation years that begin on or after March 22, 2016. However, a private corporation may assign its unused business limit in respect of its taxation year that begins before and ends on or after March 22, 2016. Under subsection 256(2), two corporations that would not otherwise be associated will be treated as associated if each of the corporations is associated with the same third corporation. An exception is where the third corporation is not a CCPC or, if it is a CCPC, it elects not to be associated with the other two corporations for the purpose of determining entitlement to the small business deduction. If this exception applies, the third corporation cannot itself claim the small business deduction, but the other two corporations may each claim a small business deduction subject to their own taxable capital limit. 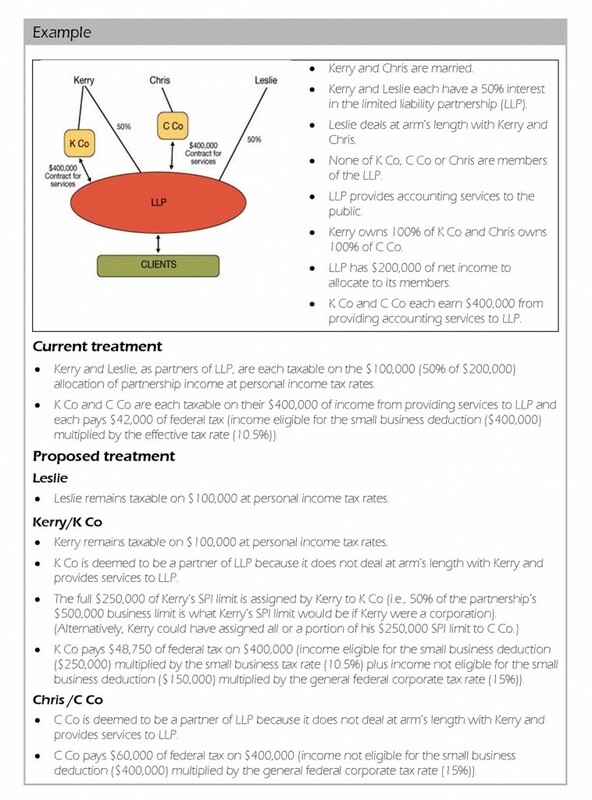 Finance is concerned that this exception is not extended to the application of subsection 129(6), whereby investment income of a CCPC is deemed to be active business income eligible for the small business deduction if that income is derived from the active business of an associated corporation. This potentially allows for multiplication of the small business deduction to the extent two CCPCs that are not associated by virtue of the exception from subsection 256(2) are claiming the small business deduction on investment income that traces to the active business of the electing third corporation. The 2016 budget proposes amendments for taxation years beginning on or after March 22, 2016, such that investment income derived from an associated corporation’s active business will be ineligible for the small business deduction where the third corporation is not a CCPC or an election under subsection 256(2) is filed. In addition, the third corporation will continue to be associated with each of the other two corporations for the purpose of applying the $15 million taxable capital limit. This measure is very targeted. Affected taxpayers will again need to revisit their planning. The 2015 federal budget announced that the government was studying the circumstances when certain types of property income could be considered to be active income. The budget documents announced that the consultation process is complete and no changes are being proposed at this time. We are disappointed by this conclusion. In practice, there are numerous circumstances where the distinction between active income and property income is very grey. In our view, new legislation should have been introduced to provide more clarity around this issue. The budget documents were silent on any capital gains inclusion rates. This is good news! Given the wide disparity in taxation rates between dividends and capital gains, there was real concern that the government would increase the capital gains inclusion rates. Accordingly, we can now move on with certainty that, at least for the next year, no changes to capital gains inclusion rates will be made. An amendment of the recovery tax rule for qualified disability trusts to refer to the new 33 per cent top rate. These measures will apply to 2016 and later taxation years. The charitable donation tax credit measure will be limited to donations made after the 2015 taxation year. In the case of the rate increase on personal services business income earned by corporations in taxation years that straddle 2015 and 2016, the rate increase will be prorated according to the number of days in the taxation year that are after 2015. The measure will also extend the proposed 33 per cent charitable donation tax credit in Bill C-2 (which currently applies to donations made after 2015) to be available for donations made by a graduated rate estate during a taxation year of the estate that straddles 2015 and 2016. Accordingly, if you’re a high-income earner, you are going to need to carefully consider the implications of the increased tax rates. Also, this high personal tax rate environment is making tax deferral planning even more important than before. The 2014 federal budget announced that the government was considering abandoning the regime in favour of the existing CCA regime. The budget documents contain detailed and complex proposals as to how the elimination and conversion to the CCA regime will occur. Such changes will occur on January 1, 2017. Overly simplified, the changes appear to essentially enable the value of existing ECP depreciable pool balances to be transferred over automatically (at the same amount) to the new CCA regime with special transition rules. After 2016, new additions to the new CCA class will be included at 100 per cent (instead of the current 75 per cent addition), and the new CCA class will be able to be depreciated on a 5 per cent declining balance basis. The usual rules applying to CCA (such as the half-year rule, recapture, capital gains and capital dividend account (“CDA”) on disposition, etc.) will apply to this new class. In order to simplify the transition, a taxpayer will be permitted to deduct as CCA, in respect of expenditures incurred before 2017, the greater of $500 per year and the amount otherwise deductible for that year. This increased allowance will be available for taxation years that end prior to 2027. In addition, in order to eliminate small ECP balances that result solely from incorporation costs, a separate business deduction will be introduced so that up to a maximum of $3,000 of such ECP can be treated as a current expense. Overall, these are welcome changes. However, there will be certain unpleasant consequences that planners will need to be aware of. For example, any realized capital gains will now be subject to the refundable dividend tax on hand (“RDTOH”) regime. This simple fact will cause the elimination of any deferral that otherwise existed because currently, ECP proceeds are taxed as ordinary income (potentially even entitled to the small business tax rate) and not subject to the RDTOH regime. However, as a positive, careful tax practitioners know that ECP proceeds are generally only half taxed, whereas the other half is added to the tax-free CDA surplus pool. The addition to the CDA pool occurs on the first day of the following taxation year from which the ECP proceeds were received. This often catches many practitioners by surprise. The transition to the new regime should eliminate this trap. This budget proposal is a surprise. It was first introduced in the 2015 budget and was welcome given the years of lobbying that occurred to try to level the playing field, since capital gains realized on direct donations of certain prescribed securities have been exempt from taxation for some time now. The government had introduced draft legislation regarding this proposal and the CBA/CPA Canada Joint Committee on Taxation had provided comments to the Department of Finance on such proposals. While the exact reason for its elimination is unknown, this decision appears to be politically driven as opposed to policy driven. We are very disappointed by this. In the 2015 budget proposals, amendments to the capital gains avoidance rules contained in subsection 55(2) were released. Since that time, there has been no shortage of practitioners commenting on the proposals, including numerous submissions by the Joint Committee. The announcement that the government is proceeding with such changes is not surprising. Practitioners should be warned: complexity in this area is unavoidable and you need to consider these changes for your clients. The budget documents do a good job explaining the policy concern surrounding this proposed change. Life insurance proceeds received as a result of the death of an individual insured under a life insurance policy (a “policy benefit”) are generally not subject to income tax. A private corporation may add the amount of a policy benefit it receives to its capital dividend account, which consists of certain non- taxable amounts. A private corporation may elect to pay a dividend as a capital dividend to the extent that the corporation’s capital dividend account has a positive balance. Capital dividends are received tax-free by shareholders. The income tax rules for partnerships also account for a policy benefit being non-taxable. The adjusted cost base of a partner’s interest in a partnership is increased to the extent of the partner’s share of a policy benefit received by the partnership. A partner can generally withdraw funds from a partnership tax-free to the extent of the partner’s adjusted cost base. In the life insurance context, only the portion of the policy benefit received by the corporation or partnership that is in excess of the policyholder’s adjusted cost basis of the policy (the “insurance benefit limit”) may be added to the capital dividend account of a corporation or to the adjusted cost base of a partner’s interest in a partnership. Some taxpayers have structured their affairs so that the insurance benefit limit may not apply as intended, resulting in an artificial increase in a corporation’s capital dividend account balance. A similar result could be achieved under the rules for computing the adjusted cost base of a partner’s interest in a partnership. This planning may allow those taxpayers to avoid income tax on dividends payable by a private corporation or on gains from the disposition of a partnership interest. These results are unintended and erode the tax base. Although the Government is challenging a number of these structures under the existing tax rules, Budget 2016 proposes to amend the Income Tax Act to ensure that the capital dividend account rules for private corporations, and the adjusted cost base rules for partnership interests, apply as intended. This measure will provide that the insurance benefit limit applies regardless of whether the corporation or partnership that receives the policy benefit is a policyholder of the policy. To that end, the measure will also introduce information-reporting requirements that will apply where a corporation or partnership is not a policyholder but is entitled to receive a policy benefit. This is a significant change that will apply to policy benefits received as a result of a death that occurs on or after March 22, 2016. Life insurance and tax advisors will need to very carefully consider this proposal when crafting client estate plans involving life insurance. Complex detailed legislative proposals are contained in the budget documents. Attendees of our seminars know we have not been a big fan of a strategy put forward by certain life insurance advisors. The plan involved the transfer of a personally held life insurance policy at fair market value to a non-arm’s length corporation for consideration – usually involving a promissory note payable to the transferor. Because of the specific application of the “policy transfer rule,” often the result of such a transaction would be no taxable gain or income inclusion to the transferor of the policy and no taxation on the receipt of the consideration – the promissory note. Frankly, we have been baffled for years that such a “plan” technically works (save for the application of the general anti-avoidance rule). The result of the “policy transfer rule” has been the mass marketing of such a “plan” resulting in the extraction of large corporate surplus amounts without taxation. Such “plans” are now dead. The budget measure will, where the policy transfer rule otherwise applies, include the FMV of any consideration given for an interest in a life insurance policy in the transferor’s proceeds of the disposition, and the acquiring person’s cost. In addition, where the disposition arises on a contribution of capital to a corporation or partnership, any resulting increase in the paid-up capital in respect of a class of shares of the corporation, and the adjusted cost base of the shares or of an interest in the partnership, will be limited to the amount of the proceeds of the disposition. This measure will apply to dispositions of life insurance policies on or after March 22, 2016. While certain insurance advisors may not be happy with this proposal, we do think this measure restores correctness to the overall taxation system so as to prevent an inappropriate corporate surplus strip without the incidence of tax. Mr. Apple is 75 years old and in poor health. Mr. Apple owns a term to 100 life insurance policy with a death benefit of $1M. The cash surrender value of the policy is nil. The adjusted cost basis (“ACB”) of the insurance policy is nil. Mr. Apple has recently had his insurance policy actuarially valued at $800K. Mr. Apple is the sole shareholder of “AppleCo” – a Canadian-controlled private corporation. AppleCo has retained earnings in excess of $10M. Prior to the announced proposals, Mr. Apple could transfer the life insurance policy to AppleCo for fair market value consideration of $800K – say a promissory note. The non-arm’s length transfer of the policy would not trigger any taxable income inclusions since there is no CSV of the life insurance policy (pursuant to the rules under section 148 of the Act). Further, there was no specific rule under the Act to tax the $800K of consideration received by Mr. Apple from AppleCo thus, effectively, he would be able to extract $800K from his corporation without tax. Now, with the budget proposals and if the transfer occurs after March 21, 2016, the $800K will be included in Mr. Apple’s proceeds of the disposition of the life insurance policy pursuant to proposed amendments under subsection 148(7). Mr. Apple will now be required to pay income tax on such amounts received in excess of the ACB of the policy at normal rates. In addition, for dispositions that occur on or after March 22, 2016, a new rule under paragraph 148(7)(b) will require the ACB of the insurance policy to be increased by the amount of the deemed proceeds received by Mr. Apple on the transfer. Given the fact that the ACB has been increased, the CDA addition for AppleCo will be reduced upon Mr. Apple’s death thus reducing the amount of funds that can otherwise be extracted from AppleCo tax-free. Ouch! For dispositions of policies that occurred prior to March 22, 2016 and a death that triggers the receipt of the life insurance proceeds after March 21, 2016, proposed amendments to the definition of “capital dividend account” under subsection 89(1) of the Act will require a reduction of the CDA by the $800K (since the $800K is in excess of the CSV of the policy). Again, ouch! This, in effect, has a retrospective effect of punishing transfers of policies prior to March 22, 2016, since the ability to extract the life insurance proceeds from AppleCo will now be reduced by the value of the consideration received in excess of the CSV of the policy disposed. Canada has been a very active member in the OECD’s base erosion and profit shifting (“BEPS”) project. As discussed in the budget materials, the BEPS project aims to improve the integrity of international tax rules to ensure that businesses pay taxes on their profits based on where the economic activities giving rise to those profits take place, and where value is created. The OECD released its final package of reports on October 5, 2015 and Canada endorsed the recommendations shortly thereafter. To improve the integrity of Canada’s international tax system, the Government is moving forward with a number of initiatives to address BEPS. Budget 2016 proposes new legislation to strengthen transfer pricing documentation by introducing country-by-country reporting for large MNEs. The Canada Revenue Agency is applying revised international guidance on transfer pricing by multinational enterprises, which provides an improved interpretation of the arm’s length principle. Canada is participating in international work to develop a multilateral instrument to streamline the implementation of treaty-related BEPS recommendations, including addressing treaty abuse. The Canada Revenue Agency will undertake the spontaneous exchange with other tax administrations of tax rulings that could potentially give rise to BEPS concerns in the absence of such exchanges. The Government is continuing to examine the recommendations pertaining to the other aspects of BEPS. Canada is committed to the BEPS project and will continue to work with the international community to ensure a coherent and consistent response to BEPS. While beyond the scope of this blog, this is a fast moving area. Time will tell if the BEPS project is ultimately successful, but Canada’s announcement that it is moving forward by introducing, for example, country-by-country reporting for MNEs and spontaneous exchange with other countries’ tax administrators of tax rulings is noteworthy. What is even more interesting is that Canada is participating on the development of a multi-lateral instrument to streamline the implementation of treaty-related BEPS recommendations. Such an instrument would prevent the necessity for Canada to have to renegotiate all of its tax treaties with its treaty partners in order to implement any intended changes. Such a project is very ambitious and a bit mind boggling as to how such an instrument would actually work. Practitioners will continue to watch this fascinating space. Recent budgets have introduced numerous new personal tax credits. We predicted in our budget prediction blog that this budget would be no different. As many of our dedicated readers know, we are not fans of personal tax credits. Such credits are often nuisances and not worth the effort (notwithstanding that the social policy objective might often be admirable). Our prediction was correct. This budget introduces a new teacher and early childhood educator school supply tax credit. It will allow an employee who is an “eligible educator” to claim a 15 per cent refundable tax credit based on an amount of up to $1,000 in expenditures made by the employee for “eligible supplies.” The budget documents contain lengthy detailed proposals under new section 122.9 of the Income Tax Act as to how such rules will apply. As we have previously written, such personal tax credits come with legislative and administrative complexity and the introduction of this new personal tax credit is no exception. On the positive side, the budget removes several personal tax credits. The first is the Family Tax Cut – or so-called income splitting tax credit – introduced by the previous government. The Liberals’ election campaign called loudly for the repeal of this credit and the budget documents confirm it. In its place, the Liberals are proposing a new Canada Child Benefit program (which at the same time replaces the existing CCTB and UCCB programs). Another credit to be repealed is the children’s fitness and art credits, which will be phased out, but totally eliminated for the 2017 taxation year and forward. The last credit to be eliminated is the education and textbook tax credits for the 2017 taxation year and forward.